Jiegu, China (CNN) -- Unstable bridges and collapsed roadways kept rescuers and their heavy equipment away Thursday from Jiegu, China -- the town nearest the epicenter of a 6.9 magnitude earthquake that killed nearly 600 people and injured thousands more. Twenty-four hours after the Wednesday quake, most of Jiegu's dead were in the dusty rubble of a hotel that crumbled under the strain of the initial quake and a series of strong aftershocks. Residents painstakingly picked through the debris with shovels and ropes, ever mindful that time is a formidable obstacle to finding survivors. "We have to mainly rely on our hands to clear away the debris as we have no large excavating machines," police officer Shi Huajie told the state-run news agency Xinhua. Injured survivors aren't clear of difficulty either -- the remote, mountainous and impoverished region in Qinghai province has few doctors and rapidly dwindling medical supplies. Video: Are quakes increasing in frequency? And then there was the lack of electrical power -- the quakes cracked a hydroelectric power plant, forcing authorities to shut it down, making even a nearby airport unusable until portable generators could go online. Chinese President Hu Jintao and Premier Wen Jiabao ordered local authorities to "go all out to save the disaster-stricken people," Xinhua said. Vice Premier Hui Liangyu was dispatched to the region. The quake shook the region shortly before 8 a.m. Wednesday (Tuesday 8 p.m. ET), when many residents were still at home and schools were just getting started for the day. Nearly 60 of the dead were students at several schools in the province, authorities told Xinhua, and more than 50 are trapped in the debris with little chance of rescue. Xinhua reported that 25 students were rescued from a vocational school, and another 23 from a primary school. Can buildings be made earthquake-proof? "Our top priority is to save students," Kang Zifu, an army officer in Jiegu, told Xinhua. "Schools are always places that have many people." China's state run CCTV reported that more than 1,000 people had been rescued, but authorities said they expected the death toll to rise. Qinghai province in northwestern China, home to about five million people, is considered a gateway to Himalayan Tibet. More than half its people are Han Chinese, but the area is home to more than 40 different ethnic groupings, including Tibetans, Hui and Mongols. Jiegu is in Yushu prefecture, a Tibetan region with a population of about 350,000 people -- about a third of whom live in Jiegu. Most are poor, making their living as farmers and herdsmen. But the region is also rich in natural gas and marked by copper, tin and coal mines. 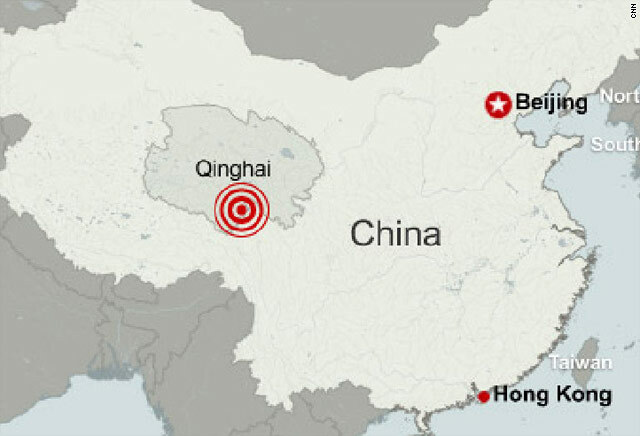 The region has a long history of earthquakes, 53 with a magnitude of 5.0 or greater since 2001, according to China's Earthquake Administration. One Jiegu resident told CNN that when his house began to shake, he grabbed his family and ran outside. Then came another quake, and his house collapsed. His family is now in tents, he said, but he had managed to buy water. He said they had seen no government assistance. People were living in fear, the man said, and some were headed up into the mountains to escape the threat of flooding should the reservoir -- also cracked in the quake -- break. More than 85 percent of the mostly wooden and earth-walled houses in Gyegu had collapsed, a prefecture official told Xinhua. In Yushu, 90 percent of the houses collapsed, leaving many homeless, the Hong Kong Red Cross said. Temperatures in the area are forecast to be around the freezing mark at night, the Red Cross said, so "provision of emergency shelters for the victims remains a high priority." CNN's John Vause and Eve Bower contributed to this report.